Olympus Evolt E-500 is the entry level digital SLR (d-SLR) camera that was designed from the ground up to be wholly digital. Olympus Evolt E-500 dSLR features 8 effective megapixel full-frame transfer CCD, 15 scene modes, 10 exposure modes, Zuiko digital-specific lens that matched to the camera’s image sensor plus an internal CPU, 2.5″ HyperCrystal LCD which has up to a 160-degree viewing angle, xD-Picture Card, CompactFlash or both dual media slot, TruePic Turbo image processor and Dust Reduction System with Supersonic Wave Filter. PC Magazine reviews Olympus Evolt E-500 and concludes with editor rating of 4 out of 5 that Olympus Evolt E-500 is a full-featured D-SLR that offers lots of options for novices, prosumers, and even pros. It’s a worthy alternative to the Nikon D50, current Editor’s Choice, and the Canon Rebel XT, but not quite good enough to replace them. Olympus Evolt E-500 is a very good entry-level D-SLR that falls just shy of greatness. TrustedReviews concludes with overall rating of 9 out of 10 that E-500 should secure Olympus a place on the lucrative consumer D-SLR shelf alongside the Nikon D50, Canon EOS 350D and Pentax *ist DL. It is a very well designed camera, combining excellent picture quality, outstanding performance and lots of creative versatility, while still maintaining beginner-friendly simplicity and easy handling. It is a genuine pleasure to use, and produces superb results. If you’re looking for a good SLR for under $600 with a lens, then it should definitely be on your shortlist. 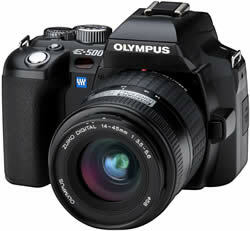 For more features, specifications and sample images, visit Olympus Evolt E-500 official homepage (no longer available).